IT'S A [neutral zone] TRAP! Below are some GIFs and screencaps fro Day 7 action. The original post: 40 reasons. It's been a while. I think it's time to add to the list. Here are 50 more reasons to love Tuukka Rask. During the 2011 Stanley Cup run, the Boston Bruins gave their "player of the game" a vintage Bruins jacket that Andrew Ference bought on e-bay. Read more about it at the end of this post. Last year, their short playoff run involved a padlock necklace that ended up, in hindsight, to be a sad reminder of the impending lockout. 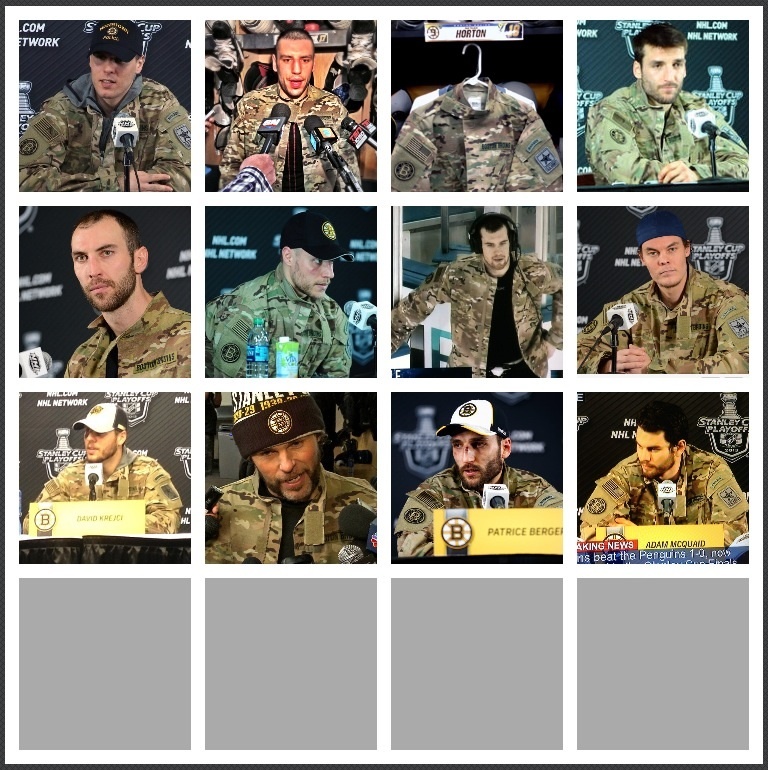 This season, Andrew Ference decided to return to the Jacket route, introducing an Army Ranger jacket to the team given to him by a personal friend that is himself an Army Ranger. Don't you ever desperately want to pass the time until the next series, but it's only Monday night, into Tuesday morning, and the series doesn't start until Saturday? And suddenly you're in a black hole of YouTube videos that have nothing to do with the Bruins, and you really miss Blake Wheeler? I looped back around to David Krejci thankfully...and stumbled upon some semi-recent interviews from the lockout when he was over in the Czech Republic. Here is the video, which, can you believe?! is in Czech! Why would they be speaking Czech in the Czech Republic? I watched a few minutes of this despite knowing it was entirely in a language I cannot comprehend because I'm really bored, I like watching Krejci speak Czech, the set is cool, and it felt like "Inside the Actors Studio" a little bit. When spontaneous English did not happen, I deferred to twitter to help me find someone to translate the video. And since twitter is awesome and full of great people, this wonderful woman came to the rescue! This interview isn't actually interesting, and doesn't have any worthwhile insight, which makes it even more wonderful that she took the time to translate it for me. Seriously, thank you! Below is the video and the tidbits that were worth sharing because I'm starved for entertainment. Because we can't get enough! And because reason #1 was reason alone to make another list. Make sure you read the first 40 Reasons, of course.